I've never cooked ribs before. It's something I've left to the pros, like my favourite, favourite, favourite BBQ joint, Boneheads BBQ. When we were out shopping Thursday night though, there was a pretty good deal on some small packs of pork back ribs, so I decided to give it a go. Friday morning, I remembered that there was a barbecue rib recipe in my new America's Test Kitchen Slow Cooker Revolution cookbook and I knew it was going to be what I used. Like most good slow cooker recipes, this one does have a couple extra steps, but I loved that the extra steps were after the slow cooking, not before, because sometimes my cooking skills at 8 AM are not the sharpest. The original recipe is fairly large and should be made in a large oval slow cooker. I scaled it down as I only bought 2 lbs of ribs and cooked them in my small round 3.5 quart slow cooker. It served two rib-loving adults a reasonable portion without making pigs of ourselves (that would be some sort of weird cannibalism wouldn't it?). I tried the little one with them, but like 99% of the food I cook, I got a happy but firm 'nope!'. This is one time we were quite happy not to share. I'll put the full recipe quantities in parenthesis but the recipe is written with my adjustments. You can use your own homemade barbecue sauce or your favourite store-bought. Since this was a last minute decision and I was short on time, I did use store bought with fantastic results. Right now we have a Budweiser BBQ sauce from Costco on the go. In a small bowl, mix together paprika, brown sugar, cayenne and S&P. Rub this mixture all over both sides of your ribs well. Arrange ribs in the slow cooker by standing them up against the wall of the stoneware pot, thicker side down and meaty side against the pot. Pour barbecue sauce over the ribs, cover and cook for 6-8 hours on low (I did 7 hours and they were perfect). Now comes the only stove/oven work involved, we need to reduce the sauce and then brown the ribs under the broiler. These steps are what turn the ordinary into the extraordinary, so don't you dare skip them even if your ribs already look pretty good. 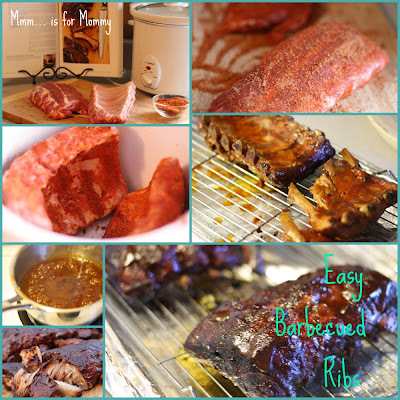 Once the initial slow cooking is done, very carefully (as they are tennnnderrrrr) remove the ribs to a baking pan which you have lined with foil and put a rack on (like in my photo collage), bone side up. Set to the side. Skim any fat that has risen to the top and strain all of the remaining juices from the slow cooker through a mesh strainer into a small saucepan. Bring to boil and allow to simmer and reduce by about a third, approximately 15 minutes. Put your oven's broiler on to heat up and make sure that there is an oven rack about 10 inches below the broiler element. When the broiler is preheated, brush the ribs with sauce and broil for 3 or 4 minutes. Take them out and very carefully flip them over, brush with sauce and broil again, meat side up, for approximately 9 minutes, taking them out once or twice (I did only once because I forgot) to baste with more sauce. Serve any remaining sauce on the side with the ribs. This is very interesting - I had no idea you could cook ribs in a crock pot! Cool!